2016 may have a stomach churning, gut punching year in the realm of politics and celebrity deaths, but at least it’s also been a rip-roaring thrill ride for Londoners who like to eat out. Some truly wondrous restaurants have opened in the capital over the past year – and London already has more than its fair share of belly-bulging beauties. In previous end-of-year special articles, I’ve examined the most popular restaurants of the past 12 months based on what you like – or more specifically my website stats indicating which restaurants you, collectively, have most likely visited. I abandoned this approach at the end of 2015 as the same old patterns were repeating themselves which doesn’t tell you, or me, anything new or interesting. Instead, I scanned my beady eyes over the best dishes of the year. 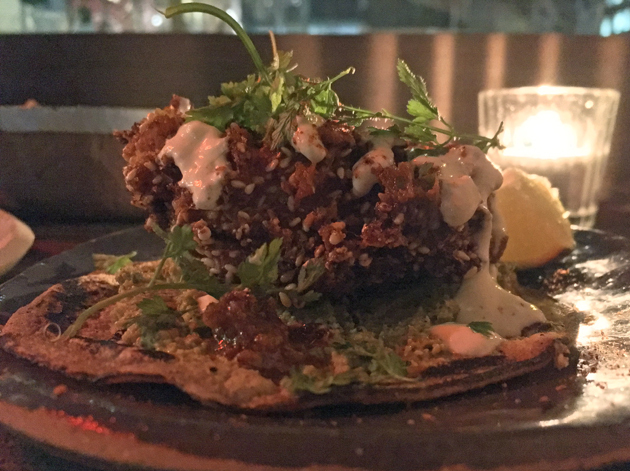 I’ve done the same again for 2016, rounding up the very best dishes which are still available so you can enjoy them (hopefully as much as I did). As with 2015, this was a little more difficult than it initially sounds. The renewed focus on seasonal ingredients and dishes as well as the ever evolving, experimental ambitions of the best restaurant kitchens means that some blockbuster dishes aren’t available all year round – or at least not in the exact forms in which I first encountered them. I’ve therefore stretched and bent my rule, in places, on only including dishes that are still available. Bellanger is a delightfully tranquil and grown-up Alsace-Lorraine restaurant in Islington. 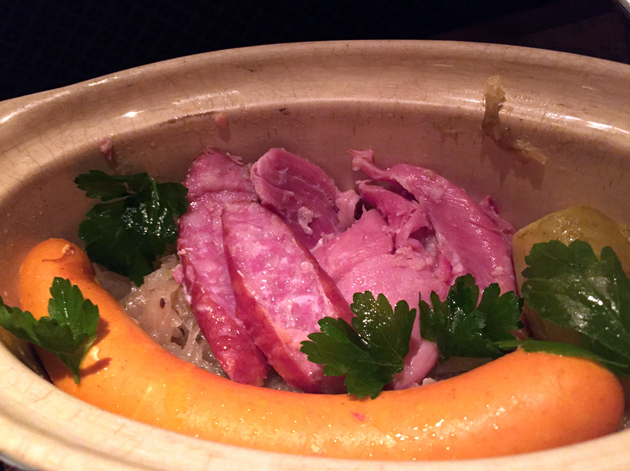 Although getting a table on and around the weekend can be hard, it’s still one of my preferred cubby-holes after a stressful day thanks to the well-oiled service, soothing surroundings and comforting Alsatian classics such as the Choucroute à l’Alsacienne. A collection of pork products, potatoes and sauerkraut may not sound like much, but it is when it involves well-chosen comfort cuts of pig that hit the spot both in terms of texture and taste from speck-like pork belly to ham hock and sausages good enough to rival their Germanic counterparts. 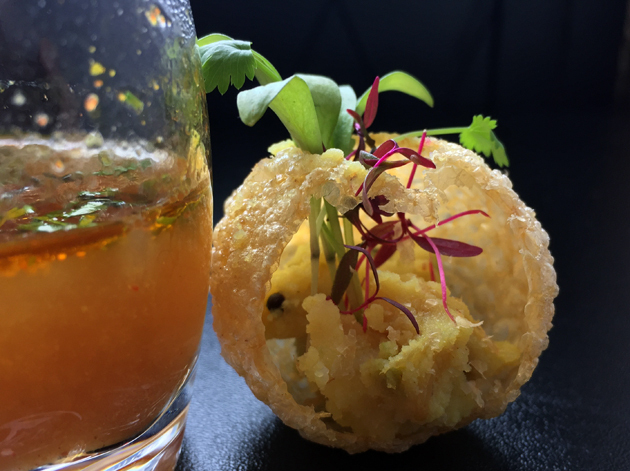 London is seeing a new wave of casual Indian restaurants that eschew the curry house staples in favour of more eclectic, esoteric and lighter fare. New batches of such eateries seem to come and go every few years, but I hope that Gunpowder doesn’t go anywhere, anytime soon. 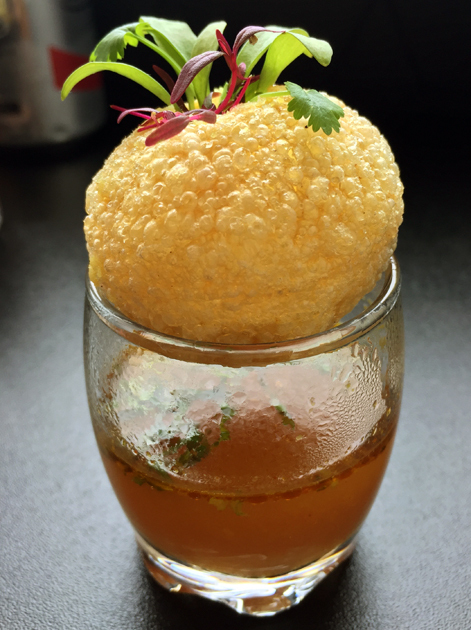 The rasam ke bomb, a sort of puchka crossed with a mini dosa, was filled with light and fluffy lentils and made even better by a dipping consommé of uncommon depth and sophistication. A superb pairing. 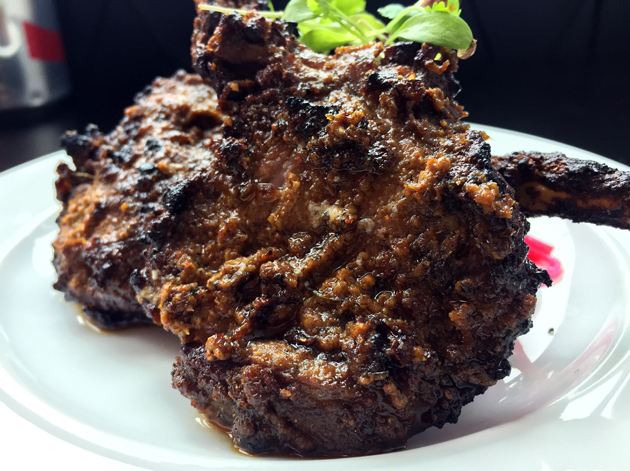 Whitechapel stalwart Tayyabs is located a short distance away from Gunpowder and is famed for its lamb chops. But Gunpowder’s chops are even better with a crisp crust and a mutli-layered, multi-spiced wet rub that elevated the meat to new heights. Xi’an Impression has been around for a while now, but this small Chinese restaurant near the Emirates stadium was still one of my highlights of the year despite its cramped, unglamorous surroundings as it’s one of the very few Chinese restaurants in London specialising in Shaanxi cuisine. The biang biang noodles tower above almost every other dry (i.e. 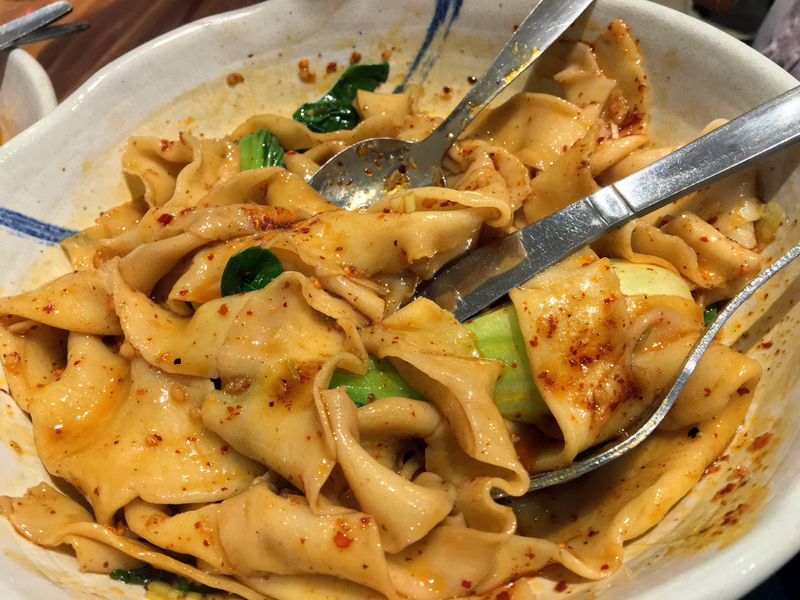 not served in soup) noodle dish in the capital – thick, wide, supple and taut ribbons tingling with spice and interspersed with crisp bok choy. It’s sublime in its deceptive simplicity. It’s worth mentioning that a deliberately profane and crass poetic flourish in my original review pissed off a commenter from Temper (another restaurant featured in this retrospective) which delights my inner juvenile delinquent. Always a plus. Biang biang noodles with bok choy. 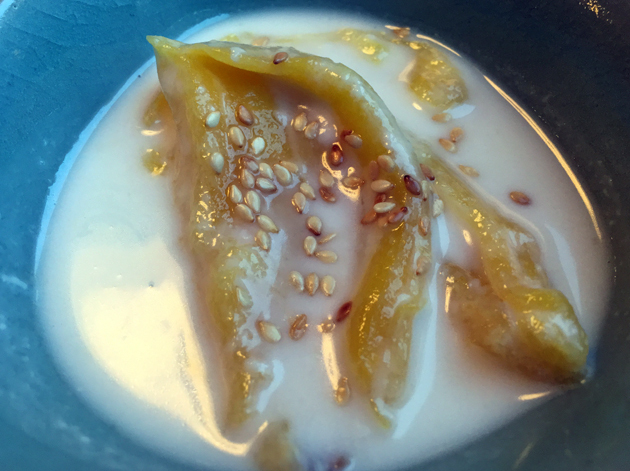 Som Saa was undoubtedly one of the most intensely pleasurable restaurants I visited all year, but its ever-changing menu makes it tricky to include in this dish-based guide. It’s unlikely any of the firecracker curries, salads or soups will leave you disappointed, but for our purposes I’m highlighting their equally splendid desserts. 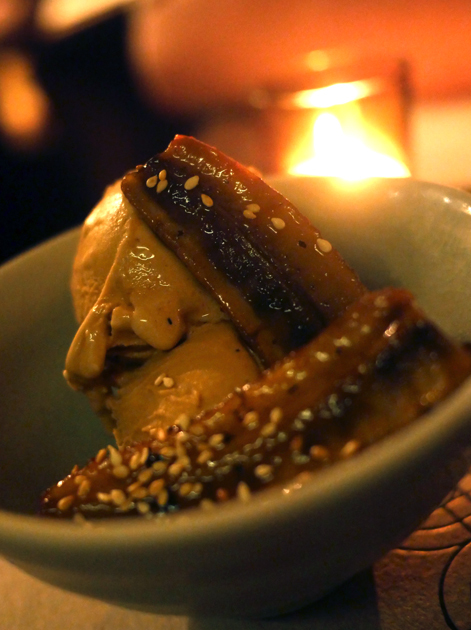 Both the palm sugar ice cream with grilled banana and the poached jackfruit with coconut milk and grilled rice are subject to tweaks and changes, but I’m including them here anyway. Not only are they delicious enough to impress The Euro Hedgie, my vicious dessert snob of a dining companion, but they show just how mind-expandingly good a dessert can be when pastry chefs stop depending on spiralling levels of mediocre chocolate and heart-stopping amounts of butter. This food a-peels to me. Like Som Saa, Kiln is a Thai restaurant that blows away the fusty cobwebs that have built up over the cuisine’s undeservedly tired and staid image in London with startlingly bright, vibrant and hot flavours that are also nuanced and precise. 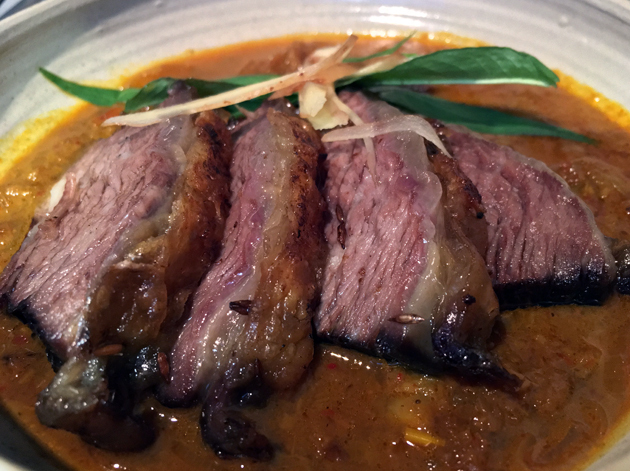 Sumptuously soft slices of beef short rib served in a musky sweet sauce tingling with a cumulative heat will make you forget that drab green chicken curry ever existed. Kiln’s brill dish is subject to change, with other fish sometimes taking its place. 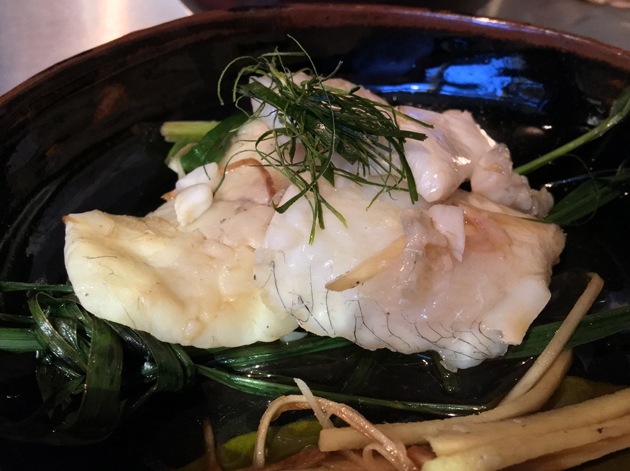 Light, yet meaty and glossy sheaves of brill proved to be an ideal conveyor for a thin sauce bursting with the classic Thai flavours of lemongrass and galangal, but have rarely been shown off to better effect. 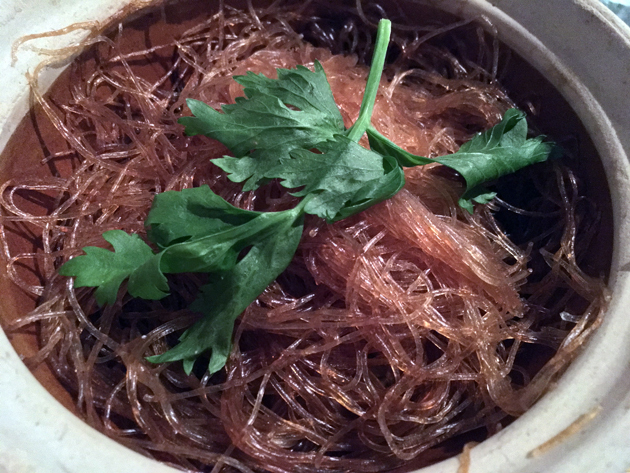 I could include almost everything on the menu at Kiln in this guide, but I’ll finish this entry with the pork belly served with brown crab and glass noodles. On paper, this is nothing more than a few cheap cuts of meat and seafood with weedy-looking noodles. In practice, the porcine fattiness meshed beautifully with the grainy, evocative tang of the sea and supple, umami noodles. Class. 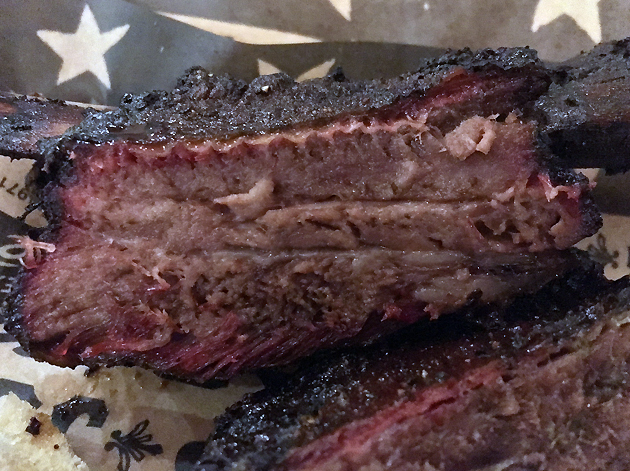 Smokestak in Shoreditch has been lauded by some other reviewers as the best American-style barbecue in London, or at least has been garlanded with uncritical praise. 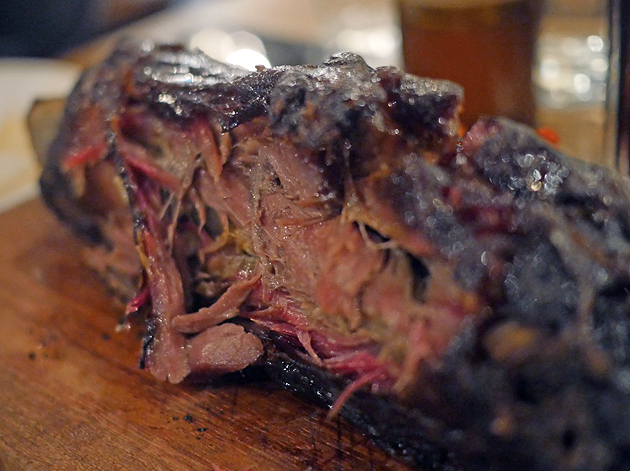 While Smokestak is indeed very good, it’s a decidedly second-best option next to Texas Joe’s Smoked Meats. 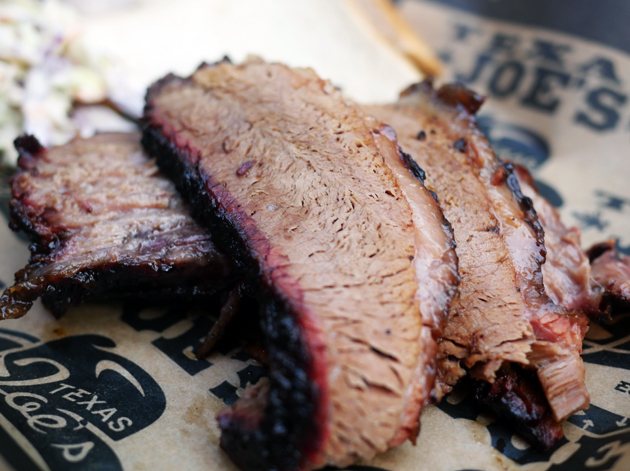 I can only speculate as to why Texas Joe’s has been overlooked by others, especially when Joe’s truly superlative beef brisket, beef short rib and pork spare ribs set the standard by which all other London US-style barbecue restaurants are now judged. You should rush down there right now. Don’t make a liar out of me, Joe. 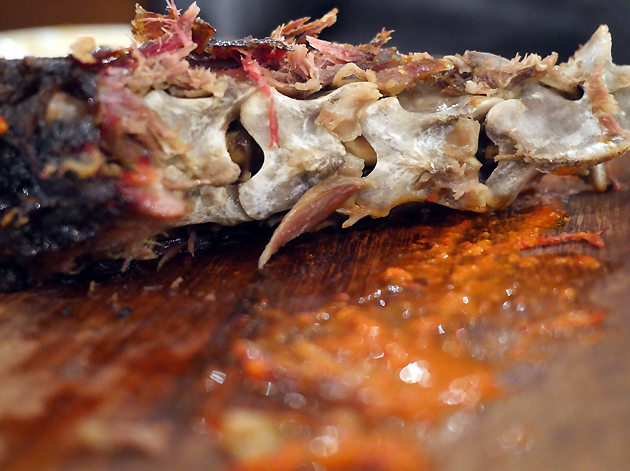 Pitt Cue is now mentioned in the same breath as Texas Joe’s when it comes to London barbecue, but the two aren’t really the same thing anymore with Pitt Cue moving away from the Southern canon and embracing meats, cuts and techniques that make it a British barbecue joint in a class all its own. Almost any dish made using Pitt Cue’s iconic mangalitsa pigs is enough to make me audibly lustful, but including a whole class of meat would be stretching the bounds of this dish-based guide one sinew too far. 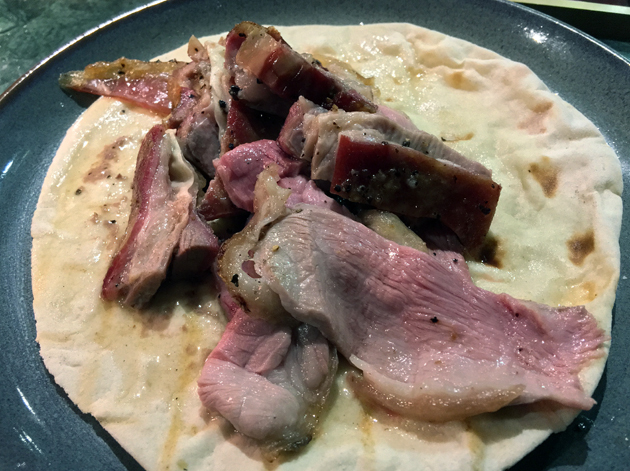 Instead, I’ll highlight a fairly frequent special dish that’s almost as wonderful as the mangalitsa-derived pork – smoked lamb neck. Its combination of visceral sensuality and sophisticated nuance was more than enough to tickle my tongue and warm my gonads in various indecent ways. Neil Rankin, the head chef at Soho’s Temper, is even more cantankerous than I am on social media so it’s no surprise that I’ve managed to piss him off on Twitter at least once a year for several years going now. He’s a lovely chap in person though (and I’m fairly certain he didn’t, errr, penetrate my anonymity cloak), but it would be still be worth eating at Temper even if he wasn’t. 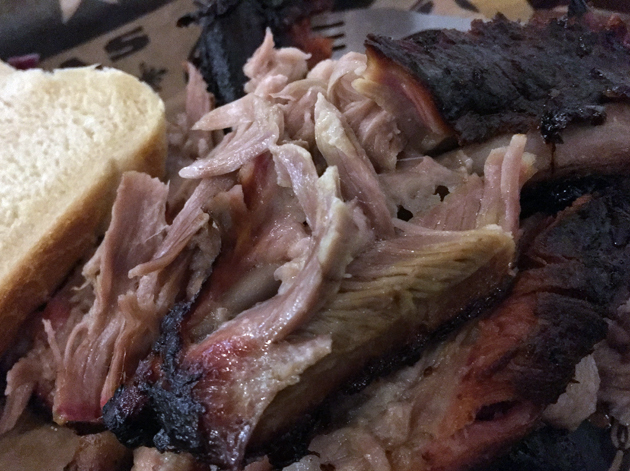 Various smoked and grilled meats are served by weight in 100g portions so you can have as little or as much as you like (a fact hilariously missed by some other reviewers). Although this means your serving of meat won’t line up exactly with what I had, I’d be astonished if your lamb isn’t as well-crafted as mine was – tender and pink with a gently earthiness, beautifully rendered fat and a chewy, fruity bark. 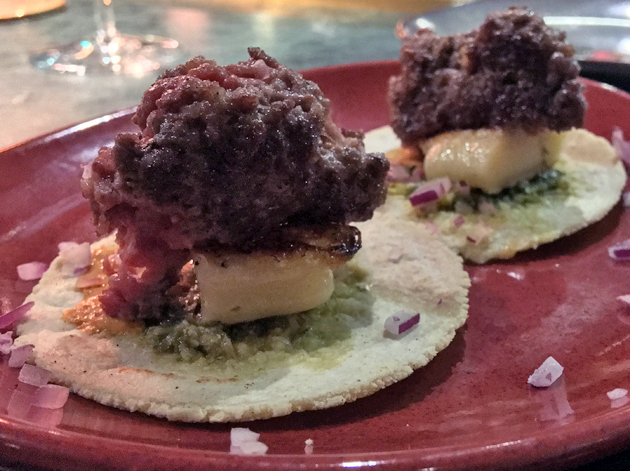 Temper’s selection of tacos can be hit and miss with some so-so quality tortillas involved, but the cheeseburger tacos is definitely one of Rankin’s best. Minced beef good enough to put most full-size burgers to shame was beautifully complimented with umami-crusted potato and a thigh-slapping sauce. Sorry Killer Tomato, but you’ve been decisively one-upped in the burger-taco stakes. Breddos Tacos hasn’t been getting as much critical love and attention as El Pastor and, once again, I can only speculate as to why. Although this Clerkenwell restaurant isn’t as steadfastly traditional as its Borough rival in its choice of tortilla fillings and toppings, it’s nonetheless consistently better in almost everything it does. Despite the so-so tortillas, I could wax lyrical about almost all of Breddos’ tacos. I’ll highlight just two though. Battered, deep-fried sweetbreads combined sumptuously rich and squidgy offal with a batter that was somehow both crisp and lightly chewy. I’ve frequently voiced my unpopular opinion that chicken is a dull, uninteresting meat fit only for children and the elderly. One of the few exceptions to this rule is the expertly fried chicken used here as a taco filling. 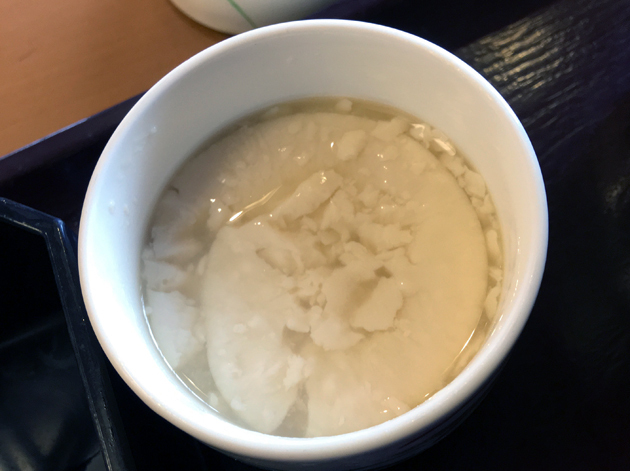 Exceptionally crisp and light batter enveloped a chunk of chicken that managed to do what chicken rarely does – it surprised me with a range of sensual textures. The majority of my best dishes of 2016 are meat-based. While not intentional, it does reveal a latent bias in both my mind and in where a lot of kitchens tend to focus their efforts. I’m not a total meathead however and you shouldn’t be either. 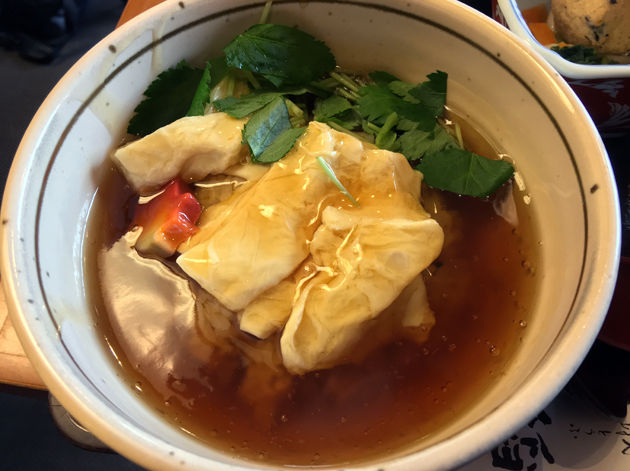 Having said that, some of the best non-meat dishes I had this year were found not in London, but in Kyoto. This shouldn’t be a surprise given that ancient city’s centuries long tradition of vegetarian food. 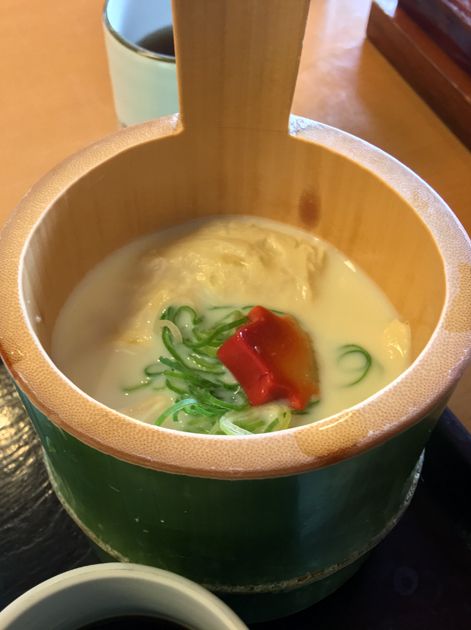 Although of little practical benefit to most Londoners reading this right now, Sagatoufine’s yuba ankake, kumiage yuba and chawanmushi tofu dishes nonetheless showed just how exceptionally delicious and texturally varied tofu dishes can be. Plus, they highlight just how lazy and deeply inadequate a lot of vegetarian food in London and Brighton (London’s plant-eating suburb-on-sea in all but name) really is. 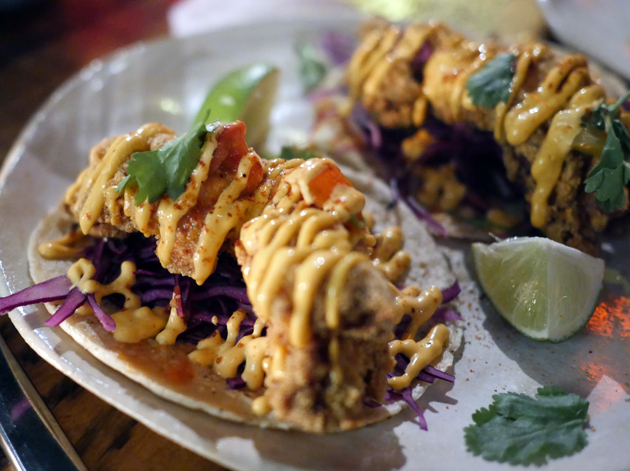 If there’s one area in London’s restaurant market ripe for improvement, then it’s this one. Attempting to decipher Hiragana and Kanji characters when you have a negligible grasp of the language is bloody hard. Yes, I’d like a bath tub’s worth of tofu please. Deciding on how to Romanise Japanese names is also a minefield. Finally, it’s only fitting to pay tribute to the excellent restaurants that have closed in the past year such as Piquet, Yumi Izakaya and Santo Remedio to name just a few. Some of those restaurants may be reborn in one form or another, others may not. The London restaurant business has always been a harsh one with culinary quality far from the only factor in determining success, so tears shouldn’t be shed lightly. But it’s hard not to feel indignation, especially when drearily mediocre, head-shakingly bad and nauseatingly faddy eateries continue to thrive, while their betters do not. I’m even worse at predicting the future than an election pollster, but I’d be surprised if 2017 doesn’t see more restaurant closures with London’s property crisis and the possible effects of a certain referendum, among other factors, taking their toll. We live, and eat, in interesting times. Tags: banana, beef brisket, bellanger, best, breddo's tacos, brill, chops, crab, curry, fried chicken, gunpowder, ice cream, jackfruit, kiln, lamb, london, noodles, pittcue, pork belly, puchka, restaurant, review, ribs, sagatoufuine, short rib, som saa, sweetbreads, temper, texas joe's, tofu, xi'an impression. Bookmark the permalink.